"I didn't do anything. Give me back my bicycle!" This fine recent film from the People's Republic of China is both a smartly told story and an informative glimpse at one of the world's great cities, one that remains largely unknown in many respects in the West. In a familiar motif (be the big city New York or Los Angeles or London or Moscow), Beijing is the destination for those Chinese looking to make their fortune, to escape whatever rural lives they have been born into; the point of entry here is a job as a bicycle messenger, and we meet Guei (Cui Lin), one of the newest employees of Fei Da Express Delivery. Guei is presented with a handsome new bicycle which, in an arrangement with his employer, he will purchase with a steep percentage of his initial income. Turning over 80% of wages back to the boss seems like a tough bargain, but the split is 50/50 once the bike is paid off, and making deliveries on the mean streets of Beijing must beat the brutal agricultural work Guei is looking to escape. Early on, much is made of the fish-out-of-water aspect of the story's setup. For instance, Guei is such a rube that, when he arrives at a hotel to make a pickup for his messenger service and is mistakenly ushered into the health club, he goes along merely because he's been pointed that way, and even has a shower. It is of course just a matter of time until his bicycle is stolen—there are a few too many loving shots of the bike, alone in a rack and unlocked, Guei's pride and joy, which he must abandon for minutes at a time to perform his professional duties. Guei is thunderstruck by its absence, and vows to find it, but given that the bicycle seems to be the principal mode of transportation for the millions of citizens of Beijing, turning up his is akin to finding a needle in the proverbial haystack. 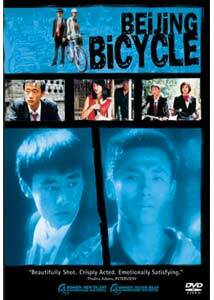 Amazingly enough—this being the movies, after all—Guei discovers a schoolboy, Jian (Li Bin), riding around on his bike, to impress his girlfriend, and the negotiation between the two claming ownership of the bicycle constitutes the better part of the movie. Jian feels unjustly taken advantage of at home—the money that had been earmarked to buy him a new bicycle will now go instead to pay for his stepsister's tuition at the school to which she has just been admitted. More than once, Jian and his friends vent their rage at the world on Guei, administering some brutal beatings to the poor messenger who just wants what's rightfully his. Guei's search for his bike must lead to the confirmation of a country boy's every worst fear about life in the big city—it's amoral, crime-ridden and arbitrary, and there's no trusting anyone but yourself. The film it may most remind you of—and may be deliberately reminiscent of—is Vittorio de Sica's The Bicycle Thief, and the similarities have more to do than merely with the movies' titles. To an American audience, De Sica's neo-realist masterpiece was as much a finely told story as a street-level glimpse of postwar Italy; here, it's the day-to-day business of living in Beijing that's especially interesting for Americans. Things like the single spigot of running water in an alleyway serving an entire neighborhood, or the gentlemen doing tai chi in the streets as the world rushes past around them, or two friends sharing a toothbrush are the kinds of things that aren't integral to the story, but add a flavor and a sense of understanding of an unfamiliar place, enriching the tapestry woven by the filmmakers. The artful storytelling is done with a minimum of dialogue, so the travelogue aspects of the feature are emphasized even more, and the filmmaker clearly trusts his actors; their expressive features communicate volumes, and the director has the good sense to let many of the scenes play out in a single long shot. Cui Lin is especially fine as Guei—the potential difficulty of having a main character who is more than a little stoic is successfully averted because he so fiercely wants to make a better life for himself, and his attachment to his means of transportation is, in some respects, the purest form of love. The upsetting but necessary conclusion to the story is well done, too, and the filmmakers have the good sense to avoid showing too much direct violence. (As ever, the violence you imagine is always worse than what's actually portrayed.) It is not the feel-good movie of the year by a long stretch, but will probably give you a newfound respect for those on the hardscrabble urban streets eking out a living, no matter on which continent. Image Transfer Review: A very nice transfer, with strong black levels and deeply saturated colors. Only a scratch here and there interferes with the video presentation of this well-shot film. Audio Transfer Review: The dynamics on the Chinese soundtrack are steady, and dialogue, music and ambient noise are well balanced. A little bit of hissing can be heard every now and again. Extras Review: Sony has provided a healthy number of chapter stops, along with an original trailer and trailers for two other Chinese-themed films. English subtitles are easily legible and without typographical errors. However, on the DVD case, the name of one of the lead actors, Li Bin, has been Americanized to Lee Bing. This is a good story well told, as well as an unfamiliar look at Beijing, and the technical values on this DVD are on par with the fine filmmaking. Some more context or information about the production team would have been nice additions, but it's a highly recommended movie and disc nonetheless.